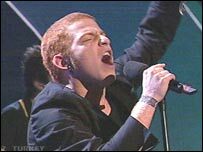 Ukraine has won the 2004 Eurovision song contest in Istanbul, Turkey - only the second time the country has taken part in the competition. 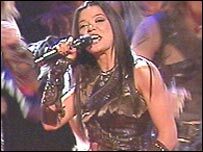 Ruslana, a successful singer, producer, dancer and composer in her home country, won for her song Wild Dance. Contest debutants Serbia and Montenegro were second, with Greece third. The UK's James Fox took 16th spot. More than 100 million viewers were expected to watch the TV coverage of the event, now in its 49th year. Thirty-six member countries of the European Broadcasting Union voted in the contest, including 12 countries eliminated from the final in earlier rounds. Last year the event was won by Turkey's Sertab Erener with the UK coming last, receiving no points. James Fox's 29 points was a distinct improvement on the zero points received by Jemini in 2003. Ruslana's winning song mixed folk music with a troupe of leather-clad female dancers. Her song was inspired by the folk music and dances of highlanders in the Carpathian mountains and included traditional instruments, a fast dance routine mixed with acrobatic moves, as well as flamboyant costumes. Greece's Sakis Rouvas had been the favourite to win the contest. The success of Zeljko Joksimovic and the Ad Hoc Orchestra from Serbia and Montenegro was a major surprise - it was the country's first-ever performance at the competition. British singer Lisa Andreas, 16, took joint fifth place with Sweden, performing a song for Cyprus. Her mother was born on the island. The host country Turkey took fourth spot in the competition. As is traditional with the Eurovision song contest, neighbours often voted for each other with the Balkan countries giving each other a major share of the votes. British TV host Terry Wogan, who was commenting on the contest for the BBC, said the "biased" voting was worse than ever. He said: "Someone has got to stop this. The European Broadcasting Union has to take a hand." Ireland, who traditionally do well at Eurovision, were in 23rd position, only one place higher than Norway who came last. The 2005 event will now be held in Ukraine. "All voting was by European citizens over the telephone"
Can you write a winning song?